Baked a lot today to take to a friend's house for Father's Day to share. 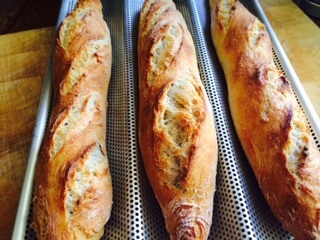 Made David'd baguettes and my old standby classic sourdough. I really hope our friends enjoy the bread. I do cheat and use the aluminum baguette baker, as it works quite well. Sorry I have been off the site so much. I have been traveling like crazy and baking less. I've got to come up with a new recipe to share. I sure loved the cream cheese batards that is currently being featured on the front of TFL. 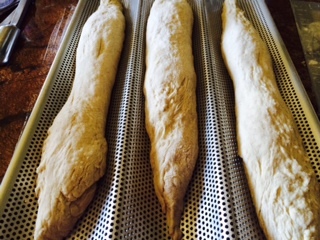 They look great - which in my book makes the baguette baker not a cheat.. but a tool. I also just bought some baguette pans as well, and love them!! I'm sure your friends will love the bread. I can taste them all the way from Toronto, ON!! Looks wonderful, Phyllis. I'm absolutely positive your friends will enjoy the breads. Beats those commercial, mass produced breads, that's for sure. Anyway, good to read from you again. Take care and keep up the great bakes. p.s. did you see this article about Siem Reap? I thought of you. Hope it is helping business! I'm well, thank you for asking! Business is going well, too. I'm on the verge of expanding my bakery, procuring equipment, and finding long-term clients. Honestly, sometimes it's a little overwhelming. And yes, I've read a few articles about Siem Reap becoming a top travel destination in Asia. Hard to say now if it helps, but I expect an influx of tourist during hot season (right now it's rainy), starting from early November this year. Hey, did you know that David Beckham recently visited Siem Reap? The locals and expats here couldn't stop talking about him for days! Great looking bakes! All of your breads look beautiful and I'm sure your recipients must have loved them...if not let them eat cake! Nice bakes Phyliss. No worries using baguette trays imo, I use them all the time. Kills 2 birds with 1 stone. You get something to support them while they are proofing and then they go straight into the oven without having to be disturbed. With a couche you have to flip them onto a peel etc. Trays are a no brainer for me. Have to ask . . . . are you pre-shaping your baggies? Gluten-free starter conversion to gluten worked! Sourdough Strada - Using that leftover bread!